Many of the Cretan churches were built inside a cave, on top of large boulders, and on the foundations of older buildings. 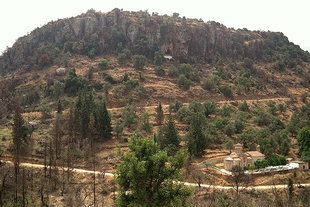 The oldest monastery on Crete, the church of Katholiko in Akrotiri, Kydonia is an example of a church built by cutting a hole in the sheer rock of a mountainside. 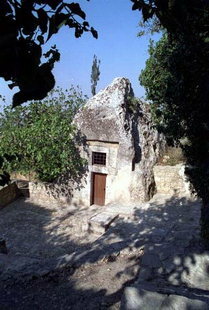 The church of Agios Iasatos in Agios Thomas, Monofatsi, has been built by cutting a large rock to house it. 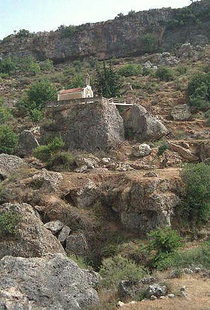 An example of a church built above two boulders is the Panagia on Two Rocks, in Fres, Apokoronas. The church of Agios Mamas in Kyriakoselia, Apokoronas, is built completely within a cave, as is also the case with the church of the Panagia (Kera Spiliotisa) in Agios Thomas, Monofatsi.